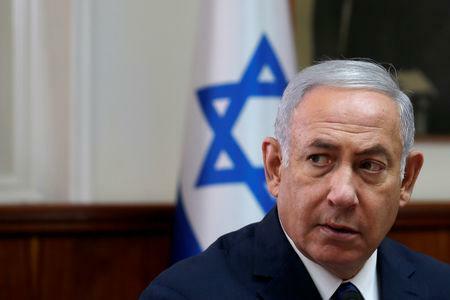 JERUSALEM (Reuters) - Israeli police questioned Prime Minister Benjamin Netanyahu for the 12th time on Friday in connection with a long-running corruption investigation. Investigators questioned Netanyahu's for several hours at his official residence in Jerusalem. Army Radio and other news outlets said questioning focused on two cases in which police have already recommended indictments against him. One case deals with gifts allegedly given to Netanyahu and his family, and the other with claims he discussed securing better coverage in Yedioth Ahronoth, one of Israel's largest newspapers, in return for curbs on rival daily Israel Hayom. No charges have been brought against the Israeli leader, who denies any wrongdoing and has called the allegations baseless. It will be up to Israel's attorney general to decide whether to file charges. Partners in Netanyahu’s governing coalition have stood by him, saying they are awaiting the attorney general's next moves. The police said in a statement that Friday's questioning lasted "a number of hours" but provided no details. A spokesman for Netanyahu said the prime minister "answered every question with full confidence, knowing clearly that nothing happened and therefore nothing will come of it." Netanyahu has also been questioned in a third case in which police allege the owners of Israel’s largest telecom company provided favourable coverage of him and his wife on a news website they controlled in return for special treatment from communications regulators.